As the gaming industry develops its technology further to create increasingly realistic graphics and believable AI, the market for its antiquities of its past remains strong. Some games for long-retired platforms are as hotly desired as new releases. For some collectors, the 8-bit era has never gone out of vogue. It can be a little daunting to enter these waters now. There are great sources hiding in plain sight while the most obvious suppliers – like eBay – can be treacherous to the uninitiated. But the payoff can be just as high for collectors. Are you looking to start your very own museum of video game history in your living room? Or just looking to relive the treasures from your past sold in some garage sale years ago? Here are some tips for starting your retro video game collection. Note: “Retro” can be a very misleading term. For the purposes of my blog, I use “retro” to refer to anything from previous generations or platforms, which may not be in production anymore, but the older the game/system, the more fitting the term. It’s a little weird to refer to PlayStation 3 as something retro, but it’s transitioning into this status right now. There are countless options to pursue for your collection, and once you are out seeking items it can be overwhelming. So many games, so little time, so little money! What platform or series do you most want to collect? Do you want to pull your PS2 out of that box in your closet, or get back the PlayStation you traded in at EB to buy the PS2? Do you own all the games in your favourite series? Start with the favourite system you still own, or the one you never owned. What condition do you want your games in? The market for CIB (Complete In Box) games is particularly strong for older cartridge games from the start of the medium to the N64; many collectors are not content with just the game itself but want its box and manuals as well. Before you collect too much, you should decide how important the games’ physical condition is. Do you need all the physical trappings or do you just want the game itself? Do you care if your games don’t have the original jewelcase slips? How much will I invest in this? In terms of time and money, that is. It can take some time to hunt down that cherished piece for your collection in the proper shape, and it may cost a pretty penny when you find it. It’s also easy to go on a spree when you find a store with a wealth of treasures. Limit yourself early. What do I most want to actually play? 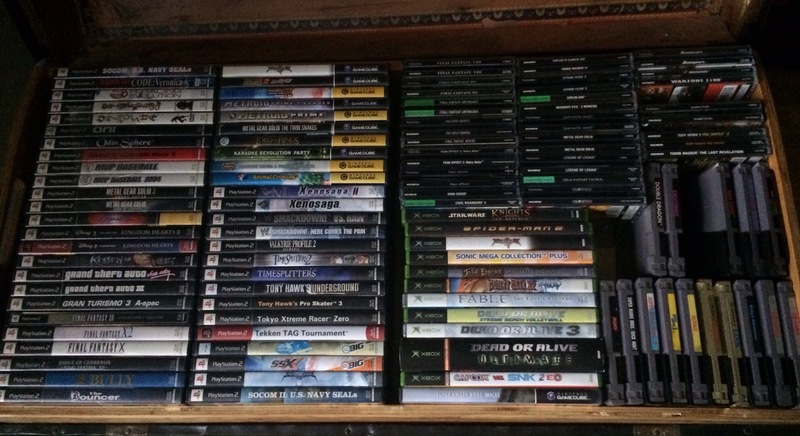 For some, it’s enough to collect a library, but the point of games is to play them. The ones you have an urge to play should go to the top of your list. To illustrate: Let’s say you love the 2D Metroid games but never played the Prime series, and your GameCube library is lacking. You decide to get Metroid Prime and Prime 2: Echoes for GameCube, and you won’t accept the cases if they aren’t original or have reproduced covers. Prime is naturally your top priority, since Echoes is its sequel, and you set aside a small amount of money to pick it up when you find it. Down the line, Echoes or even Prime 3: Corruption for Wii will come to the top of your list. If you approach this with some clear intents, you may walk away empty-handed sometimes but you’ll have more cash to buy the things you want most later. It benefits you and your community to find things locally. You don’t have to pay exorbitant shipping fees or wait for purchases to arrive, and shopkeepers in your neighbourhood can use your patronage. Online vendors make things easy, but approach them as Plan B – you’ll likely find better bargains the “old-fashioned” way. In the age of social media, Facebook and Twitter can be great resources for finding these stores, and what can’t be found on Google? Look up “retro video games” (or use “vintage” instead) and you may be surprised at the options hiding within driving range. Don’t underestimate the power of flea markets, thrift shops, garage sales, and sites like Kijiji and Craigslist, either. Many flea markets have dedicated game booths, and some people don’t know how valuable their kids’ forgotten consoles truly are. More people are flocking to online classifieds to get better resale deals than those EB/GameStop offer. All of these help other people in your physical community. 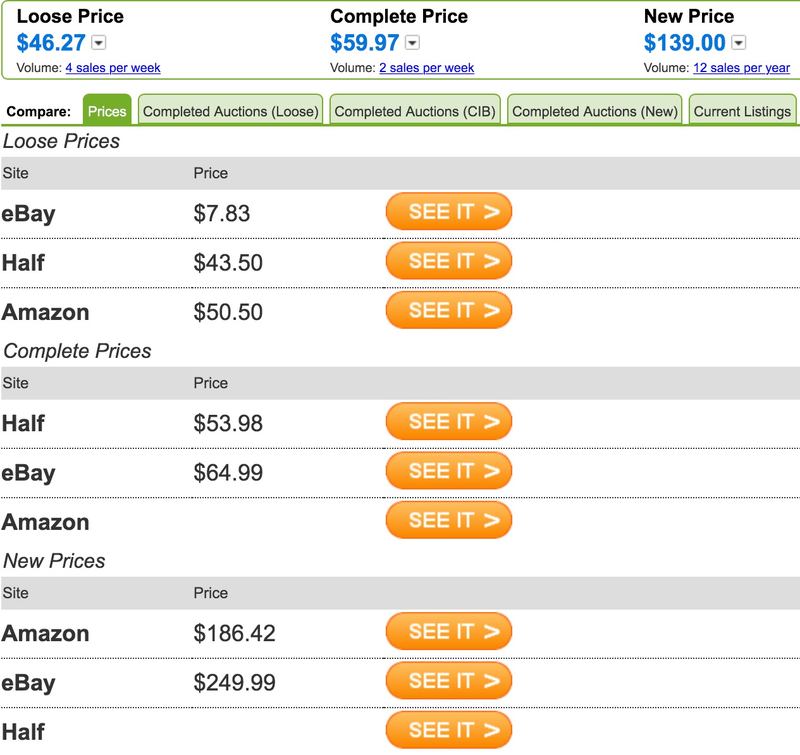 One of the greatest pros and most frustrating cons of this pursuit is the fluctuation of prices. Some merchants sell popular games at increased prices to capitalize – not much you can do about the basic principle of supply vs demand. Others are more realistic. This is where the internet is your friend. Start with price guides, or by seeing what the game you want goes for on eBay. Then check out those local shops you found nearby, or try Kijiji, and see how prices fluctuate or compare to the norm. Fluctuating prices are your best friend and worst enemy. The disc alone runs the gambit from $8 to $50; complete with jewel case and manual, it’s $54-65; and for an incredibly rare unopened-new copy, I’m looking at over $200. And this is all from online retailers, before factoring in shipping rates. When it comes to PlayStation, I just want a proper jewel case with the original manual and covers, and a functional disc – so I know $60 is a relatively fair medium. If I could find it nearby, $80 would perhaps be too much and $40 would be a steal. 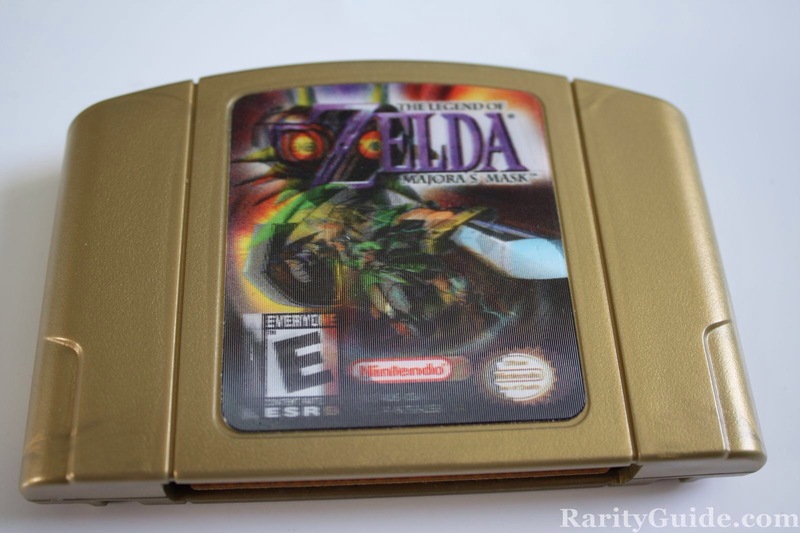 I know my local retailers well enough to know that I can go to Retailer A in a flea market and have a decent chance of finding something rare like Majora’s Mask, but that they’ll also charge a higher price for it. I can go to Retailer B and have a smaller chance of finding it but a better chance at a lower price. Or I can try Retailer C in a neighbouring town that has average availability at average prices. It can take some time to establish this familiarity with your local sources, but it pays off in the end – if you know where to go hunting, and if you know who will give you a better bang for your buck. You’ve had no luck finding that perfect copy of Tomba! nearby, and your fingers are itching to play it again. It may be time to resort to eBay or its ilk. But caveat emptor – by now it’s no surprise that you may not be getting what you pay for online, and the prices stray toward the high end of the spectrum. Many online retailers are the worst sort of opportunists, and you are a faceless sucker to them. There are many reasons not to overpay for something on sites like eBay; aside from the harm to your own wallet, you’re also feeding the trolls. This is a particular bad time for “scalpers” on eBay, with Nintendo’s under-produced hot items like Amiibos, the GameCube Adapter for Wii U, and the special editions of Majora’s Mask 3DS and the New 3DS itself. Online sharks have been snapping up preorders to resell on eBay at horribly gauged prices – sometimes triple the retail price. People want these collectables desperately and the scalpers are exploiting them horrendously. Please, for the good of all gamers, DO NOT FEED THE TROLLS. If you buy that jerk’s Majora’s Mask Special Edition New 3DS for double the price or more, you are letting him win and encouraging him to continue. Retailers should not be letting people pick up preorders like this, but regardless, you’re “letting the terrorists win” if you buy from them. And after all, is it really worth $800, even $1000, for a $230 console? This hobby/endeavour lives and dies by availability. It may take you a long time to find a copy of that gem you desire at a price you can handle. You may make the trek to your favourite game store only to find they don’t have anything near the top of your priority list. Be prepared to leave empty-handed. Think in the long term. If you can’t find the items you want on your terms, just put the money you’re ready to fork out back into your wallet and wait for the proper opportunity. Some soccer mom will clean out her basement soon enough and trade an unknown gold mine in at your favourite store, or another gamer will decide to let go of that game you covet. Consider trading as well. I know of some stores that would rather trade games than take your cash, and swapping item-for-item with other collectors can be the cheapest way to build your library. Just be absolutely certain that you’re not trading away something you’ll regret down the line, or getting swindled. A sizeable chunk of my own collection. Prices can fluctuate. When Twitch Plays Pokemon took the internet by storm last spring, the price of every Game Boy and Game Boy Advance iteration of the main series jumped about $20 at stores near me. I recently hesitated on Final Fantasy Crystal Chronicles for GameCube at Retailer A for about $30, and now it’s inexplicably $100 there. Conversely, the HD Remasters/Remakes that are flooding the new retail market can help deflate the price of the original cartridges. Trends can disrupt prices temporarily or redefine a game’s worth for years to come. Think of storage sooner rather than later. All those game cases and boxes can take up a lot of shelf space, but there are a wealth of ingenious ideas for displaying your collection. You’re doing yourself a favour if you get off to a good start on this early on, before you have a mountain to shuffle around. Test your new games! The first thing you do when you bring a new game home is make sure it works as advertised. The best stores clean, test, and guarantee every item they sell, but it doesn’t hurt to verify the quality of your purchase and make sure it will work on your own system. Check the condition of the case and cartridge and ensure it will actually play, or else you’re the proud owner of a new paperweight. Make lists of games you own & want to own. Maybe it’s just my traces of OCD, but I find it incredibly handy to have a list of my collection and a wishlist on my phone, in this case in a dedicated game collection app. I highly recommend it, if you care to fret over such a thing. That’s all the advice I can impart for now. What are the gems of your game collection? Who are your favourite suppliers? What game would you give your life savings for? Let me know in the comments below! Good luck and game on!